The weekend of July 10-11 marked the 35th Annual Solomons Island Invitational. Competing in the PHRF A1 Division was Blofish, a 1D35-Turbo owned and skippered by Dailey Tipton. Tipton along with his crew, including five U.S. Patriot Sailors, raced from Annapolis to Solomons Island in this 45 nautical mile course. The U.S. Patriot Sailing team wins the PHRF A1 Division at the 35th Annual Solomons Island Invitational. Photo by Spin Sheet. Tipton, a former Naval Officer and Dessert Shield Storm Veteran and Peter Quinn, Director of U.S. Patriot Sailing and Naval Officer, connected while Quinn searched for replacement gear for Flyer, his Oyster SJ-35. Quinn hosts U.S. Patriot crews for Thursday night racing in Norfolk, VA. Realizing their shared Navy affiliation, their conversation turned to U.S. Patriot Sailing, and Tipton suggested he would be happy to host crews on Blofish. Tipton has sailed on the Chesapeake for over 20 years and has run many successful programs including the J24, Melges 24, Olson 30, Farr 30 and now the 1D35-T. Tipton wanted the Blofish program to give back to our warriors. Besides supplying his boat, Tipton has acquired outside sponsorship to support the U.S. Patriot Sailing. All sponsorship for the Blofish program goes directly to fund travel, equipment and event expenses for the warriors. Quinn founded U.S. Patriot Sailing Program in 2013 after his friend returned from his fourth high-intensity deployment. “His difficulty with reintegration after combat moved me to build a program which offers warriors access to a healthful environment, one that naturally fits with the warrior ethos of TEAM, camaraderie, and all-in-competition” said Quinn. 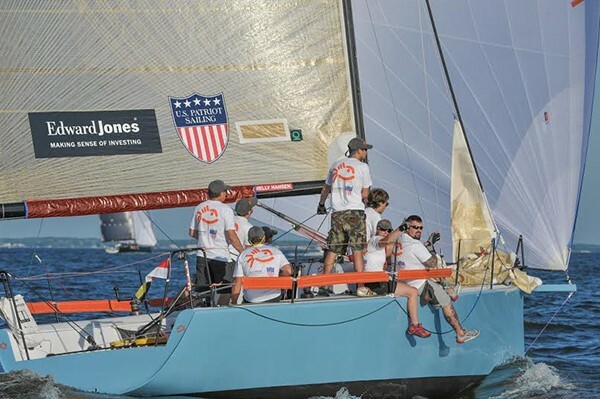 Blofish started on Friday sailing downwind through the night with a medium to light breeze and finishing on Saturday July 11 with a corrected time of 09:52:41.0 and placing first in the PHRF A1 Division. “We assumed we did well, but since we could not see anyone—we figured we were out there somewhere. It had been fun and we were tired!” said Brian DeBrincat, trimmer and tactician aboard Blofish. DeBrincat has been sailing with Tipton since 2003. Blofish has already competed in the NERY Invitational, Solomons Invitational and the Screwpile Lighthouse Challenge. The team’s next events include the Governor’s Cup, Annapolis Yacht Club Labor Day Regatta and expect to add several others to the schedule. You can learn more about this program and how you can contribute here.